Like as the case with MOST version of Hunchback aimed at kids the characters are overly-simplictic water down versions of the book characters mixed with touched of Disney. 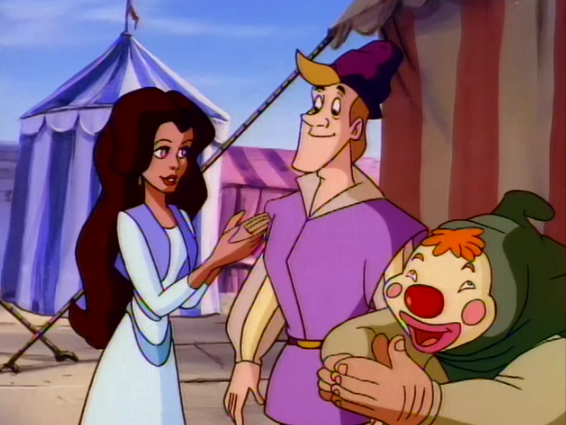 This version isn’t that much different except with regards to Frollo who is more of a copy of the Enchanted Tales version of Gaston. None of the characters are deep, they are just blandly nice, which makes them uninteresting. Is it because these movies are for kids and kids don’t need as complex of characters? I don’t think that is true. While I think kids might have a higher level of torrence for bland nice character they still can gauge that they lack personalities. But the REAl reason why these are lack anything that makes the interesting save for the weird humor is this movie is a keep crash grab off of Disney and bland characters are easier to create as no thought goes into being a nice person. One can’t just be nice. Let’s just take any character from Moomins which is aimed at children too. All the characters are generally nice but they have other facets of their personality. Moomin is naive and adventure seeking, Little My is rude and Snork Maiden is vain. They all have flaws and that adds to the likable. Quasimodo’s only flaw is that he is ugly but aside from Frollo none of the other character have flaws, though Gringoire is delightfully bad a poetry. So these character are boring version of the book characters/Disney. And yet they aren;r version of these character, Dingo and Enchated Tales are far worse.